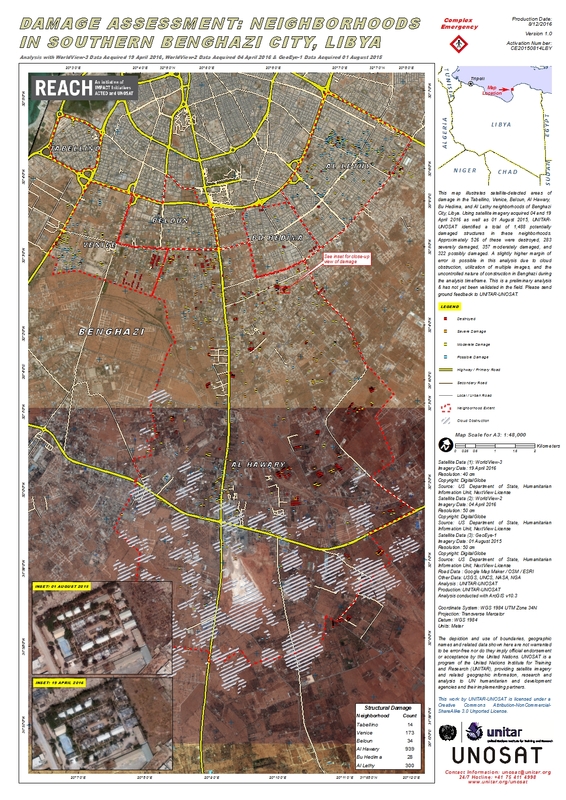 This map illustrates satellite-detected areas of damage in the Tabellino, Venice, Beloun, Al Hawary, Bu Hedima, and Al Lethy neighborhoods of Benghazi City, Libya. Using satellite imagery acquired 04 and 19 April 2016 as well as 01 August 2015, UNITAR-UNOSAT identified a total of 1,488 potentially damaged structures in these neighborhoods. Approximately 526 of these were destroyed, 283 severely damaged, 357 moderately damaged, and 322 possibly damaged. A slightly higher margin of error is possible in this analysis due to cloud obstruction, utilization of multiple images, and the uncontrolled nature of construction in Benghazi during the analysis timeframe. This is a preliminary analysis & has not yet been validated in the field. Please send ground feedback to UNITAR-UNOSAT.